For 12 consecutive seasons with the Athletics and Red Sox, Foxx slammed 30 or more home runs and knocked in more than 100 runs. 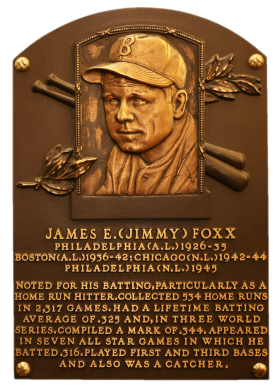 In 1933, Foxx hit .356, swatted 48 homers, and knocked in 163 RBI to win the Triple Crown. A three-time MVP, "Double X" had a lifetime slugging average of .609. 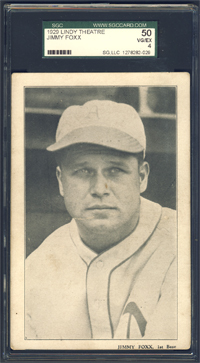 Jimmie Foxx had 534 career homers, 1,921 RBI, and a .325 average. Comments: Initially, I had a 1961 Fleer PSA 8 tribute card of Foxx purchased in March, 2000 and later sold in Nov, 2002. Around the same time I purchased a 1936 World Wide Gum PSA 1, with the face completely traced in pencil. Some kid had fun with the card, neat item. It was sold in August 2003 after finding a SGC 70 example at my first National in New Jersey, purchased from Dan McKee (consigned by Tom Lawrie). It was one of my favorite cards for a long time. I liked the WWG card but also had a DiMaggio rookie card represented by the same issue which I liked a lot more. So, if the right opportunity came up to pick up something unique of Foxx I would do it. 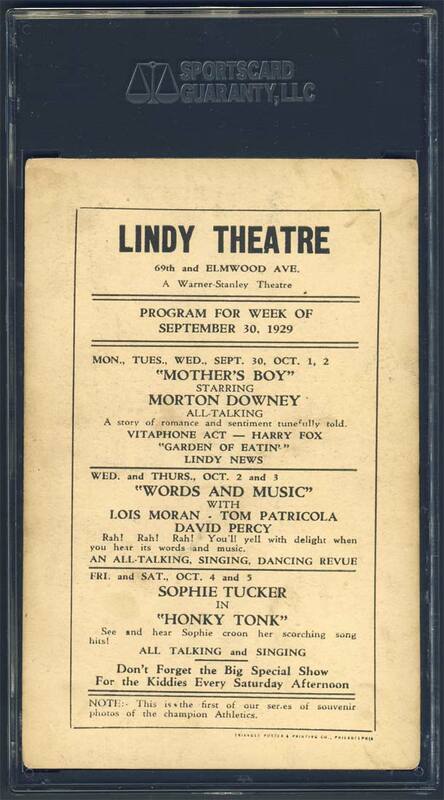 In June, 2010 I found this Lindy Theatre card on eBay and made the seller an offer. It was a complete impulse purchase. They countered and I accepted. I was afraid to haggle too much because I didn't want to lose out on the opportunity. There was only a couple other examples - originally purchased as an entire lot by Mr. Mint himself Al Rosen. He confirmed the purchase in an email correspondence I sent him. Then, I traded my WWG Foxx away with some other cards to acquire my N173 Anson. On March 12, 1928, Philadelphia's Lindy Theatre (located at 6902 Elmwood Avenue) opened its doors for the first time with Al Jolson's "The Jazz Singer". The theatre was named after the iconic American pilot Charles Lindbergh who a year earlier flew his plane non-stop across the Atlantic from New York City to Paris. Ticket prices were ten to fifteen cents in the afternoon and fifteen to twenty-five cents for evenings. The theatre was designed by architect William H. Lee and seated 1,430. The Lindy's entrance foyer was in Chinese green and gold, and had yellow and black tile fountains topped by Chinese-tile peaked roofs. Mandarin staircases led upstairs to the mezzanine lounge. Philadelphia's first semi-atmospheric auditorium was designed along the lines of a family temple in Kuangtung, China, especially with colors of black, gold and red. The decoration gave the impression of being outdoors. The walls were Chinese stone with panels in gold leaf depicting oriental flowers. Exit doors were replicas of the ancient gateways of Wanheim. The piers were surmounted by Chinese lanterns of cut stone set with panels of mica. Chinese lanterns at both ends of the auditorium had pierced iron and brass frames. Bronze deities lined the walls. The ceiling had the appearance of the midnight sky and had depictions of snowflakes, birds and butterflies. Painted ceiling beams were also of eastern style. Ceiling murals were of fire eating dragons, in gold and silver leaf.Curtains on the 48 foot wide stage opened to reveal a proscenium drop painted to represent a wealthy Chinese home with decorated doors opening and closing before the screen. Organ chambers resembling Chinese pagoda temples flanked the proscenium and were in bronze-gold colors. A United States theatre pipe organ was in the orchestra pit. After opening with "The Jazz Singer" the Lindy showed subsequent run movies, with films changing twice weekly. The Lindy Theatre closed in 1955 and was converted into a supermarket. Today the building is a thrift store. In 1929, to commemorate the Athletic's dominating ballclub that was running away with the American League championship, the Lindy Theatre issued various lobby cards of the Athletic players measuring approximately 3-1/2" x 5-5/8" which depicted black & white player portrait photos on the obverse and a listing of the week's shows and/or films on the reverse. Ultra rare and un-cataloged in SCD, a number of the handful of issues in circulation are virtually unique, with only a few copies encapsulated by SGC or PSA. With that in mind, presented here is one of the prestigious Athletic subjects, Hall of Fame slugger Jimmy Foxx in an SGC 40/3 holder. This is the highest graded Lindy Theatre card listed on both SGCs and PSA's "pop" reports, a true "1 of 1" at it's grade and one of only three Foxx examples on the planet! Unquestionably, this is Jimmy Foxx's rarest cardboard relic, and its superb aesthetics are highlighted by a fine portrait pose depicting exceptional clarity and contrast. Situated directly below his portrait pose on the lower right border is his name and left field. The image is perfectly centered between four white borders, the corners are moderately round with some diminutive soiling, no major creases are evident. 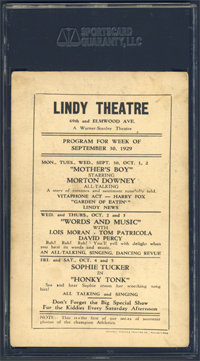 On the reverse are a list of shows for the week of September 30, 1929 including "Mother's Boy" (starring Morton Downey), "Words and Music" and "Honey Tonk" (starring Sophie Tucker), with a brief summary of each show listed below. The black typography is bold and completely intact, set against an off-white background that depicts only mild toning, especially along the top and right edges. In summary, this offering is an incredible nostalgic cardboard artifact that could be the main attraction in many serious collections. Simply stated, who owns another Lindy Theatre card, let alone one that provides a stoic representation of the hard hitting Hall of Famer Jimmy Foxx.